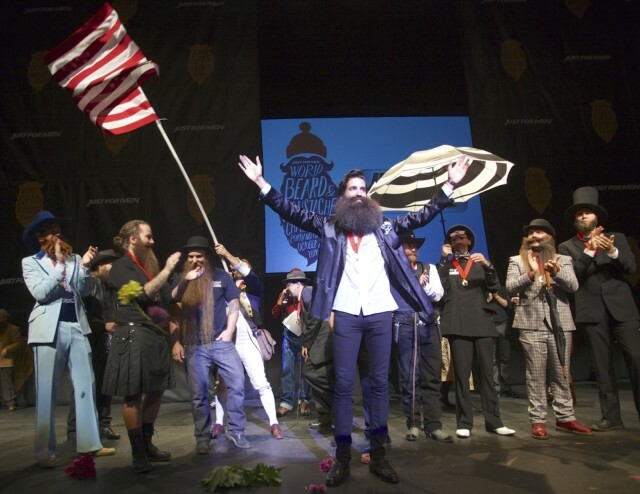 The burliest (and daintiest) beards from around the world converged at the Keller Auditorium this weekend. In the end, a 29-year-old Portlander was crowned facial hair king. Check out our slide show of the winners and wonders. The men of the World Beard and Moustache Championships are well endowed. That is to say, they are naturally gifted with the ability to grow exceptional amounts of hair on their faces. Some of these men have been "training" for months, while others have been growing for over a decade. They are proud bearers of their facial gift, welcoming the everyday stares, questions, and photos opps that go along with boasting an extraordinary chin bush. But what makes the World Beard and Moustache Championships such a special place for these men is not that they get to compete, but that they get to be amongst each other. This past Saturday at the Keller Auditorium, men from around the world—strangers, if not for their shared fervor for facial hair—conversed and drank, complementing one another’s costume or style, and cheered each other on. It was the friendliest of competitions, as everybody from veteran to rookie acted as old friends. Men like Toot Joslin, a two-time Sideburns world champion, or Michael “MJ” Johnsons, the reigning Imperial Partial Beard champion, know how this goes. They are seasoned veterans, not just here to compete, but to represent the World Beard and Moustache community. There’s a strong sense of regionalism amongst that community, too. MJ represents the Minneapolis Beard and Moustache Club, while men from the Albuquerque Bearded & Moustached Amigos were present, as well as hometown boys from C.O.M.B.S. (Central Oregon Moustache and Beard Society). Over 200 men competed in 18 categories, as five judges critiqued. The judges spanned from beard scholar Allan D. Peterkin, a professor and author of One Thousand Beards, to beard activist Shane Pittson, a BYU senior who organized a student movement to protest the school’s anti-beard policy, to beard lover Pennie Lane, of Almost Famous fame. Their criteria, as explained by host Phil Olsen, was to judge contestants on how their beard "best enhances their overall appearance, style, and personality." But in the end, no costume or style won the grand prize; rather a sheer voluminous beard was crowned king—the beard of 29-year-old Portland-native Madison Rowley. Rowley’s beard is only a year and a half old, making its nearly foot-long diameter all the more impressive (previously, Rowley was known for rocking a moustache and even has his own line of 'stache wax, Rides Wax—see his video below). It’s not that Rowley’s beard was the longest, or the most styled, but it was the most striking. At about 6'3", Rowley’s a skinny fellow dressed in tight black jeans and a black satin smoking jacket. His face is long and his short hair well groomed, but his beard is truly an unkempt masterpiece in stark contrast. His win has even grabbed the attention of the BBC and Buzzfeed. Portland’s known for its beards and proudly embraced that reputation on Saturday. It wasn’t just that a hometown boy took gold, but that flocks of facial-haired Oregonians were hooked on the spectacle of it all, the solidarity amongst their fellow bearded friends. Now a new flock may follow Rowley to next year’s Championships in Austria. RIDES from Madison Rowley on Vimeo.